Figure 1: Four layer JOSM built map (click on the image to expand it). I have been using the free NOAA ocean charts that are available from the NOAA. While these charts are wonderful, they lack in some respects when the interesting detail lies on the shore. Naturally, the NOAA data contains mostly waterway charts, making any complaint about the lack of land detail not reasonable. The NOAA charts are doing what they ought to do. Clicking on the graphic (above) will display it in higher resolution. Once that is done, it can readily be seen that the inshore detail resolution on the OSM map is somewhat better than what is on NOAA charts, where the latter of which may have only a smattering of onshore detail. 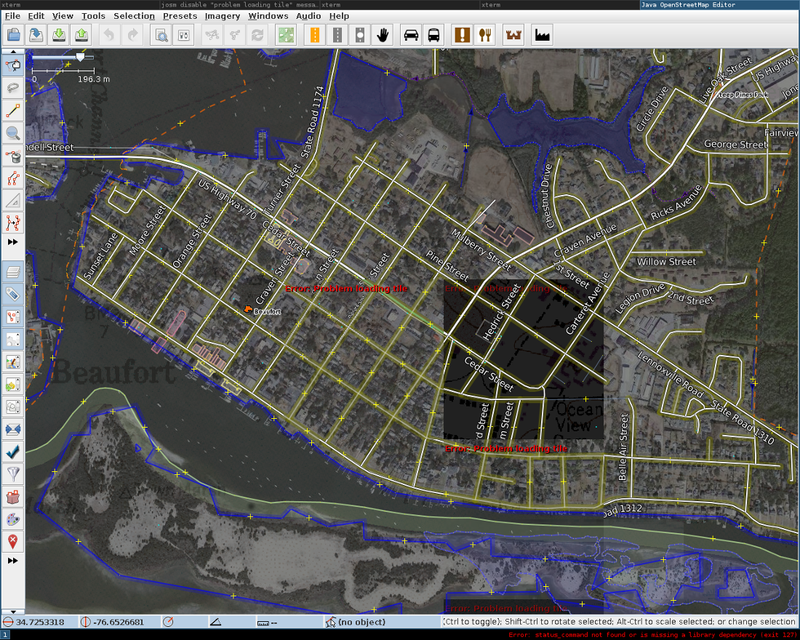 In this article, I am describing my use of OSM to compliment NOAA charts. Additionally, the maps within the screenshot contain USGS imagery, courtesy of the U.S. Geological Survey, licensed as public domain. Also, the maps within the screenshot contain TIGER (Topologically Integrated Geographic Encoding and Referencing system) data, produced by the US Census Bureau, in a public domain data source. This site and its author have no affiliation whatsoever with JOSM.